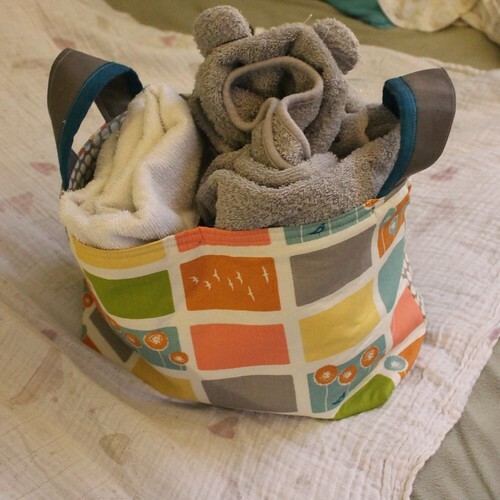 Before baby, I made a handful of cute pouches, and then waited for them to become useful.I’m sharing how we used them for our new baby, in case that is useful for any other new parents thinking about using up their fabric stash for baby storage purposes! 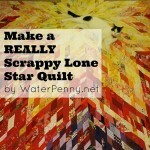 Anna at Noodlehead makes amazing patterns. 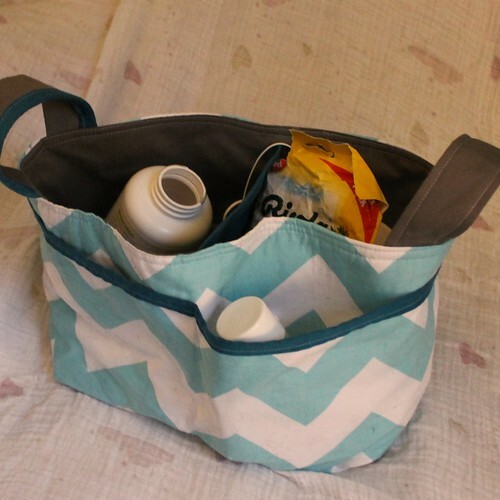 Her wide open pouch is actually a free pattern – I think it’s my favorite pouch to make and use – so handy. 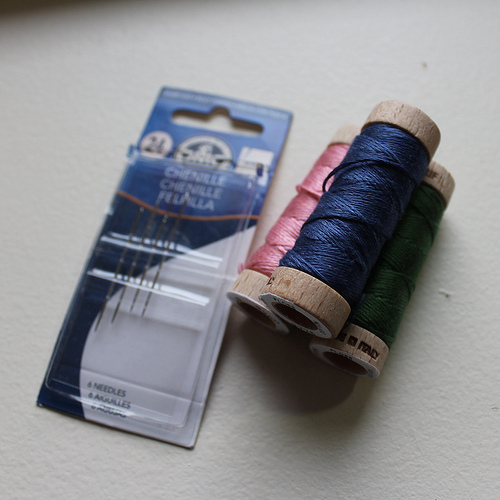 I use this one to keep my hand-sewing kit in – thread and notions for whatever project I am working on. That may not sound like a “baby” use, but our baby likes to sleep in my lap, which means I do a fair bit of hand sewing during nap time. It’s peaceful. 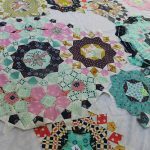 The design on the outside is made from taking the cut off triangle endings from making a quilt binding – including some precious Tula Snails and roughly sewing them down. 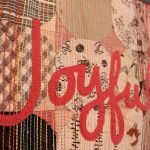 I used gold metallic thread for the quilting. Hot tip! If you put the metallic thread in the BOBBIN and sew with your fabric UPSIDE DOWN it’s wayyyy less finicky in the bobbin than when you run metallic through the needle up top. Because bobbin thread has so much less work to do, fussy threads, like heavier weight threads and metallics work smoothly in the bobbin. When they are threaded up top, they have so many places to get messed up tension when you run them through the needle. ANYWAY, I also made several of her Divided baskets, which is another great pattern! I have had a lot of friends recommend these as baby shower gifts, and they are right! They are perfect for everything baby. 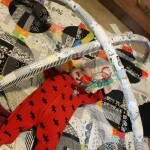 Read on to see all my Divided baskets and how I use them! This is a bath kit for baby, with soap, wash clothes and her cute hippo towel. Once the baby is in the bath, of course you are stuck there till she’s done, so it’s nice to know I’m not forgetting anything. As she gets bigger, we can put some toys in there too, but for the first few months, this is all we need. 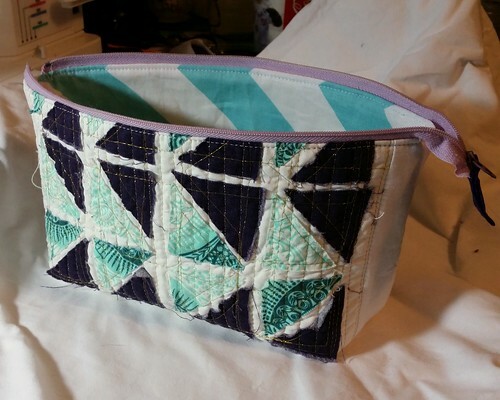 I used some older Birch Fabrics organic cotton for this pouch – I had a lot of scraps and this was a perfect project for them. The front panel pocket is pieced together, but I think it looks fun, and let me use those great dots when otherwise it would have been too small a piece! I used this next one on my bedside as a “Nursing Station” or more like “Nursing Survival Kit” Nursing was kind of an ordeal for us for a while, and I ended up being “stuck” in one place with the baby or the breastpump for long periods of time. 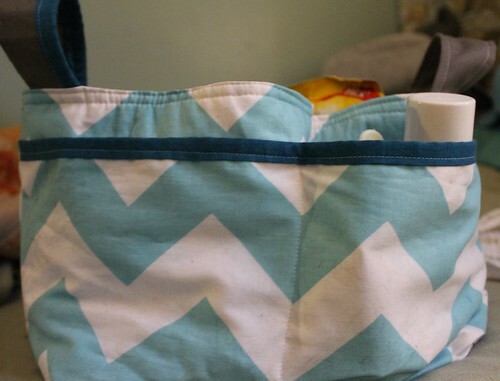 So, I put a survival kit of stuff in here – snacks, painkillers (I was sooo excited to take ibuprofen again! 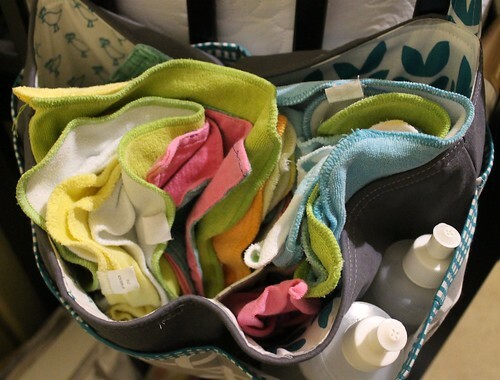 ), baby wipes, spit up cloths, water bottle, chapstick and hand lotion, cough drops – nursing makes me so thirsty and dry – and more to have at my side. Oh and chocolate – did I mention that there was always chocolate in this? After the first 6 weeks or so, I started to depend on my nursing/pumping station a lot less, so now it mostly lives by the nightstand, looking a little pathetic. 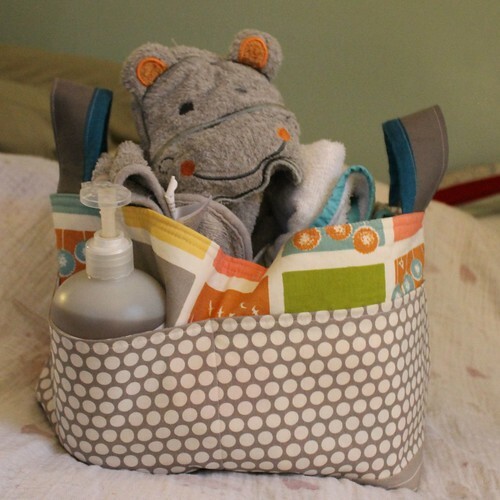 I’m sure it will eventually be repurposed, but for now it’s still handy to have a cute little organizer on the nightstand – with pacifiers, gas drops and extra burp cloths for nighttime emergencies. But this is a bit bigger than what I need, so it’s a bit saggy! The chevrons are Riley Blake large chevrons and the lining is a gray canvas weight that I had around. I kind of wish I had lined up the chevrons better, or used a contrasting fabric for the basket, but this was the first basket I made and I wasn’t sure how it was all going to fit together. 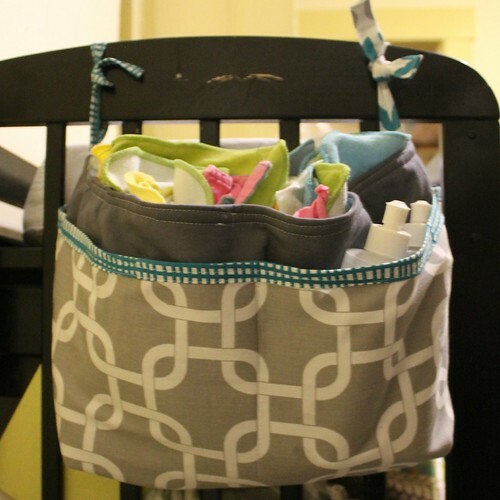 I used another Divided Basket to hang on the side of our changing table, with our reusable wipes and a water squirter (for the wipes) in it. Those who have given birth will likely recognize the squirt bottles as the peri bottles they send you home from the hospital with! They are perfect for home made diaper wipe solution! 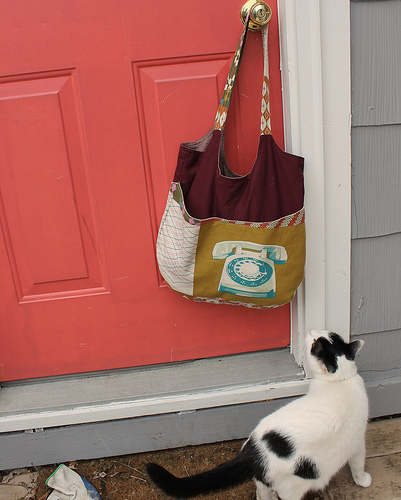 This tote used a lot of Lotta Jansdottir fabrics – with some generic upholstery fabric on the outside. Since I actually see this one mostly from the top, I wanted the lining to be cute! it has the little Lotta chickens if you can see in there. Instead of the handles, I made some basic ties and sewed those into one side during the construction. It was a very easy modification. I originally was going to use my cool snap pliers to have it snap into place, but the ties really work quite well, and were less trouble 🙂 They don’t match because I was running out of my Lotta fabric. But it’s cute that way, right? 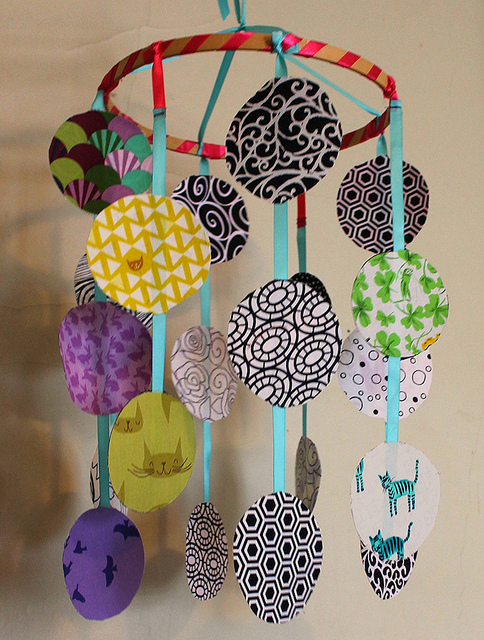 I love projects like this to use up smaller pieces and scraps. 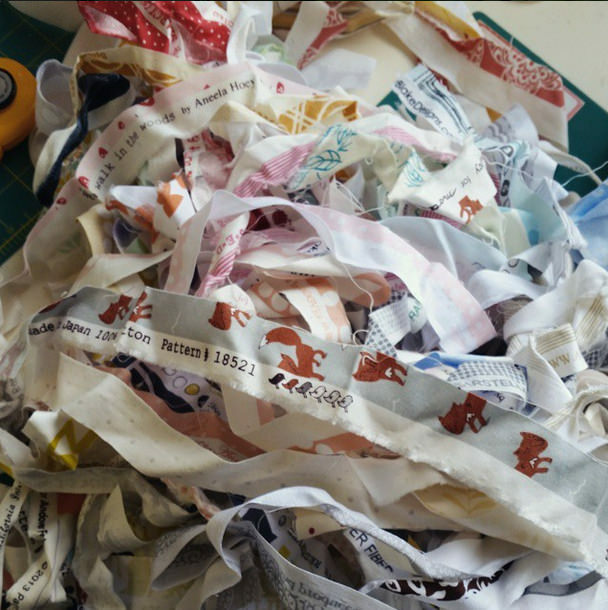 Sewing from stash feels great, especially when I’m dragging so much new baby gear into the house, it’s nice to create a few things from what i already have!